Wow! 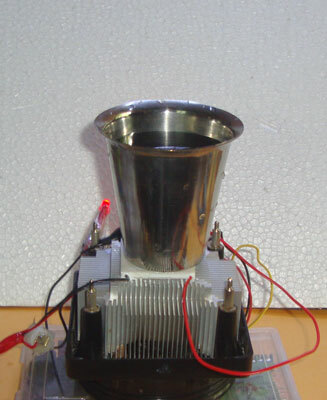 We can make a cup of cold water in 5 minutes without a Fridge. You need only a Peltier Element, a 12 volt high current battery and a Computer cooling fan. 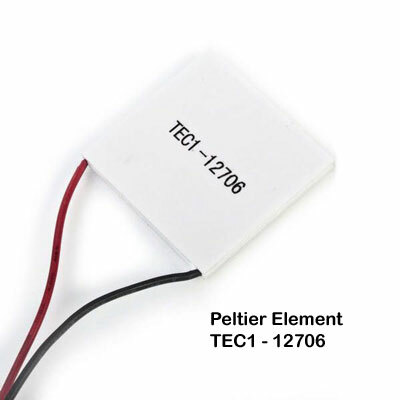 Peltier element is a semiconductor plate like device with Cold and Hot sides. When we provide 12 -18V, 1 amps power to it, one side of the Peltier suddenly cools and the other side turns hot. The cool side temperature goes down below 0 degree and the hot side becomes around 100 degree. So to transfer that much heat, the Peltier should be placed over a large Heat sink. A Computer cooling fan with heat sink is the best choice. 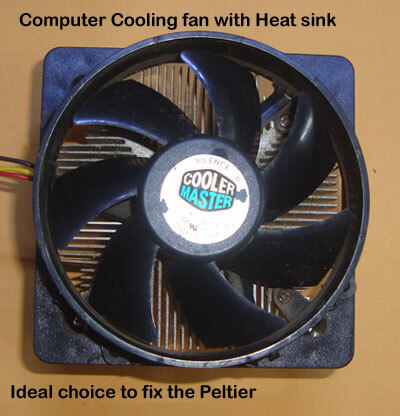 Fan will remove the heat from the Peltier and heat sink. At the same time, the cold side turns too cool in minutes. Without a heat sink, the Peltier will be damaged. If we reverse the Polarity (+ and –) of the power supply to Peltier, the sides reverses. That means, cool side becomes hot side and vice versa. 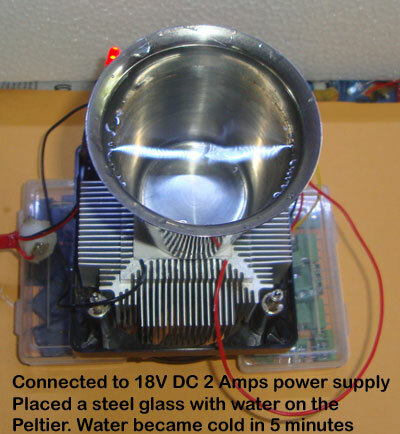 Let us make one Peltier Fridge to get some cold water. Later we can change it as a heater to drink hot water. Peltier costs around Rs.200. Different types of Peltier elements are available. These are using in Electronic gadgets as cooling devices. Here the model TEC1 127 06 is used. TEC means Thermo Electric Cooler. 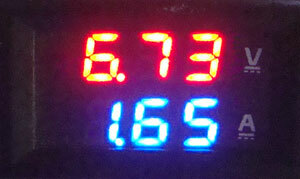 Its maximum input voltage is 15.4V. If you are connecting the cooling fan with the same power supply, increase the voltage to 17-18V. Its current rating is 6 Amps. 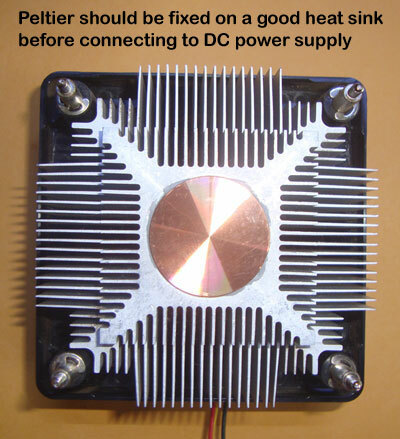 The Peltier should not be powered without a heat sink otherwise; the Peltier will be damages due to heat. So first we have to identify the cold and hot sides of the Peltier. To this , connect 1.5 V battery and check both sides by touching with finger. One side will be slightly cool and the other side will be slightly hot. Mark the Cold and Hot sides. Usually, the Number printed side will be cool. But check it. 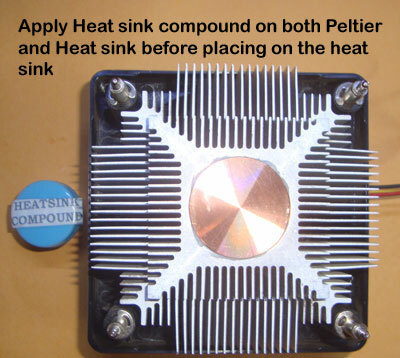 Apply heat sink compound on the Hot side of the Peltier as well as on the Heat sink. 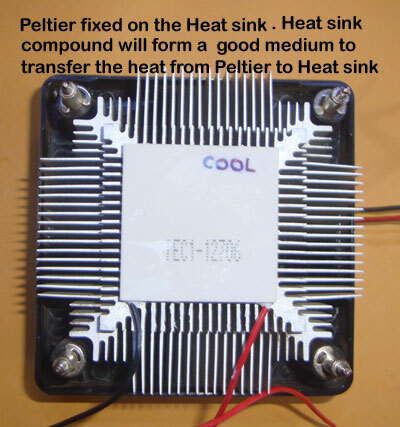 Then place the Peltier on the heat sink so that the heat sink compound will spread between the Peltier surface and heat sink surface. 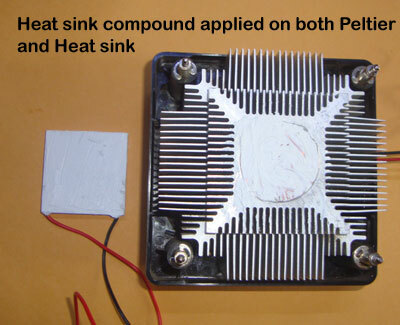 This forms a strong medium to transfer heat from the Peltier to the heat sink. Connect the positive and negative wires of the Peltier and the Cooling fan with correct polarity. So both will get power from the same power supply. When the Peltier started to take current, the voltage dropped to 6.73 volts and current consumption was 1.65 Amps. Fan will also run this time, which will take around 300 mA current. After few minutes, the Cold side of Peltier becomes too cool. Then place a Steel glass with water over the Peltier cool side. Within 5 minutes, you get cold water. 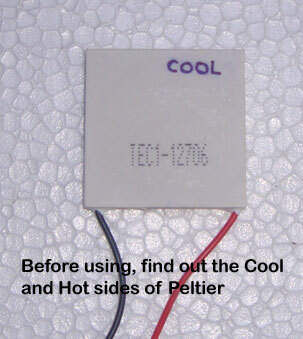 The Polarity of the Peltier can be reversed to change the cold and hot sides. Connect Positive of Power supply to the Negative of Peltier and Negative of the power supply to the Positive of Peltier. Then the Cool side becomes Hot side and vice versa. In this arrangement, we can boil the water. Peltier is essentially a Thermocouple with two layers. If current is passed to the Thermocouple, heat is produced at one junction and absorbed at the other. So the former junction cools and the latter junction heated. This is called Peltier Effect. When the direction of current changes (Polarity reversal), this effect reverses. That is, the cool junction becomes hot and vice versa. 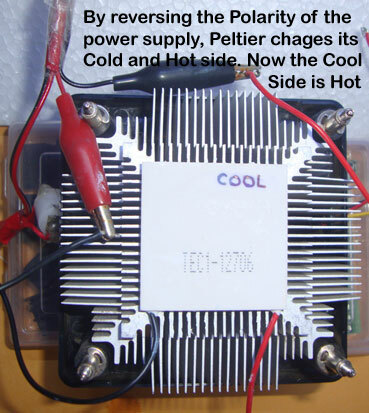 Peltier is also called as Thermo Electric Cooler (TEC). When operated as a generator, one side of the device is heated to a temperature greater than the other side, and as a result, a difference in voltage will build up between the two sides ( Seebeck effect ). The Peltier has two layers of p and n type semiconductors sandwiched between two ceramic plates. The most common combination of materials in the thermocouples of Peltier elements (TECs) are the two semiconductors Bismuth and Telluride. The semiconductors are placed thermally in parallel to each other and electrically in series and then joined with a thermally conducting plate on each side. When a voltage is applied to the free ends of the two semiconductors there is a flow of DC current across the junction of the semiconductors causing a temperature difference. 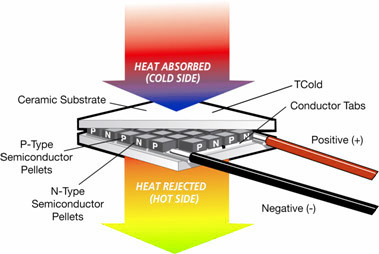 The TEC has an array of cubes or pellets made of the semiconductors, each of which is in contact with the radiators on the hot and cold side of the Peltier element. The semiconductor cubes with extra free electrons are known as N-type semiconductors, while those with few free electrons are P-type semiconductors. The pairs of P and N semiconductor cubes are set up and connected in an array so that the pairs will be in serial connection but thermally in a parallel connection. When a current is applied to the TEC, the way the current flows through the semiconductors induces a temperature difference, and causes the heat-sink side of the Peltier element to heat up, and the cold side becomes cool. 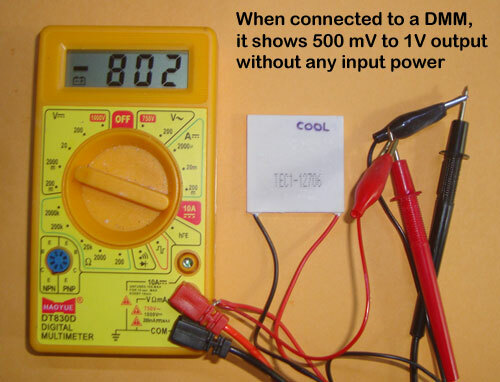 When we connect a Volt meter to the Peltier element directly, the meter will show a voltage between 500 – 800 mV. This shows that the Peltier can also generate voltage idle condition. 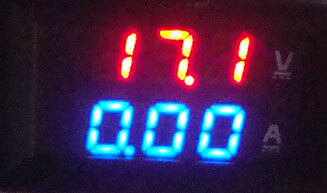 When we press the Peltier with hand, this voltage increases then suddenly drops. This is because, the heat disposal is not sufficient. So to get a steady working of Peltier, it should be placed on a large heat sink. 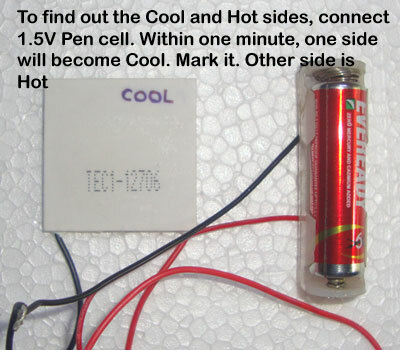 If we make one side of Peltier hot and the other side cold using hot water and cold water, the output voltage increases to 2 volt or more.